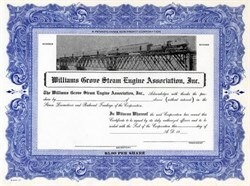 Beautiful unissued certificate from the Williams Grove Steam Engine Association. This historic document has an ornate border around it with a photo vignette of train crossing a bridge. Since 1959 the Williams Grove Historical Steam Engine Association has been preserving and operating historical steam powered and farm equipment. Their base of operations is the old Grangers fair grounds in Williams Grove Pennsylvania.